The ultimate Thailand experience awaits you. This unique adventure combines visits to famous & historic sites across the country, life-touching volunteer opportunities, adventurous activities, & cultural events. Choose from a variety of specialized volunteer projects, including teaching & sports coaching. Discover breath-taking landscapes, from the shores of Thailand’s beaches to the cascading streams inside her national parks. Travel back to the 1940s, & learn about the effects of WWII on Thailand. Visit the famous Bang Nam Pheung Floating Market, ride through the jungle on an elephant, & much more. 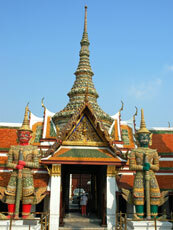 Bangkok – Take a guided tour of Thailand’s vibrant capital city. Mon Tribal Village – Discover the traditions of the Mon people. JEATH War Museum – Learn about the Death Railway & the prisoners of war forced to construct it. Bridge On The River Kwai – Historic bridge built during WWII. The Death Railway – Take a ride on the train. Hellfire Pass – Noted section of the Death Railway. Kanchanaburi War Cemetery – Burial site of POWs who built the Death Railway. Koh Phangan Island – Home to the famous Full Moon Party, held on the beach. Erawan National Park – Famous park in Thailand featuring enchanting waterfalls. Sai Yok Noi – Famous waterfall inside Sai Yok National Park. Culinary Lessons – Learn how to make traditional Thai dishes. Assist the children in developing good communication skills. Lead children in exercise routines to encourage an active & healthy lifestyle. Work alongside teachers during pre-school classes. Lead & assist with fun & educational activities (i.e. games, arts & crafts, sports, music). Assist with activities for the physically disabled. Assist children with their homework. Help impoverished communities in Chon Buri establish a greater presence of sports. Volunteering as a professional coach aids in the development of talented sports players & helps players gain an enthusiastic pride for the game. Some of the main responsibilities of coaches are to teach the game’s regulations, encourage practice & improvement, & educate the players on the importance of team work & how they might establish a career in sports. Help create a brighter future for students in the Chon Buri region. Volunteer to teach at a local school, helping students to learn & improve their skills in communication, the English language, fine arts, & math. Teachers will have the opportunity to learn first-aid responses & incorporate fun games & activities into their lessons. Jomtien Beach – Features fun water activities (i.e. scuba diving, parasailing, wind surfing, & paragliding). Bangkok National Museum – Features historical, cultural, & fine art displays. Bangkok Art & Cultural Centre – Nine-floor exhibition center featuring modern works of art. Bira Circuit – Features a more than 4,000 foot go-kart race track. Nong Nooch Tropical Botanical Garden – Charming & colorful, 500-acre garden situated in Chon Buri. Baiyoke Tower II – Bangkok’s tallest building, towering almost 1,000 feet above the ground. Thai Alangkarn Theatre – Features a vibrant & exciting cultural performance. Highlights of the show include fireworks. Bang Nam Pheung Floating Market – Famous local market on water featuring fresh produce & traditional Thai foods. Asiatique The Riverfront – Historical area situated on the Chao Phraya River. A popular hub for dining, shopping, & scenic views.